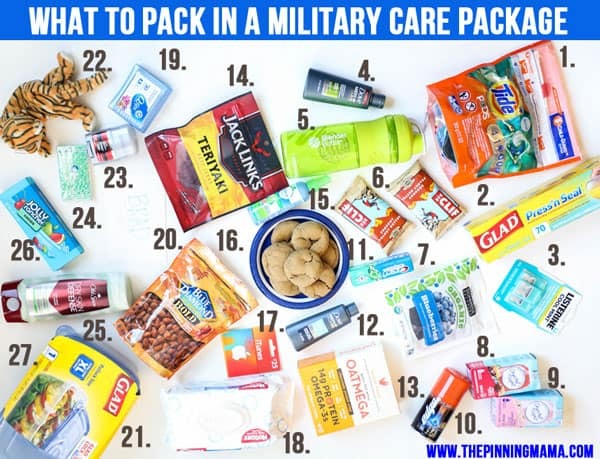 Over 30 ideas of things to pack in a military care package that will be useful, fun, or entertaining. While our troops are working hard over seas to ensure our freedoms and receiving a care package can really make a difference by letting that soldier know that they are thought of, appreciated, and remembered. These small comforts from home are not small to them, but the things that keep them going when times get tough. This post is sponsored by Glad and their Glad to Give program. Sending care packages to troops is a big part of my life as a military family and I am happy to partner with Glad to share some of my best tips. And the answer is yes. And no. You see I have been sitting here and dwelling on the world. I have felt the weight of it on my shoulders, and I came to this conclusion. Everyone has a season. Everyone has things that they can do and feel called to, and things that they can’t do. With our home situation, I can’t just pick up and go to volunteer, or to a rally at a moment’s notice, but that doesn’t mean I don’t care. I do care. I care deeply. About my family. About you and your family. About our country and our world. What I can do is use the resources that I have. Use the passion I feel and put that to work for causes that make a difference in places that matter to my heart. All I can do is try to make a difference in small ways, that build up and turn into big ways. For you that may mean one thing, and for me that probably means another. But the beauty of it is, that if we all give, if we all try to make a difference, and if we are all choosing love, then there are enough of us to really make a difference in this world. I don’t talk about it a lot here on my blog for a number of reasons, but we are a military family and so we know first hand from experience how hard deployments can be on both the service members that are gone and the families at home. During the holidays we tend to do a great job remembering our troops, but when January rolls around we get back to our normal routines and it is hard to keep those that are still serving in the front of mind. When you are deployed there is little that brings great joy. The days are long and monotonous. There are few comforts and little variety in your daily routine. A package arriving can be the highlight of not just the day, but the week, month or entire deployment. It can mean someone out there remembers you. They appreciate you. They want you to come home. It can give strength, joy, and simple comforts all in the form of things we take for granted daily. The Glad to Give program celebrates giving in all of it’s shapes and forms. You can visit the website to see inspiring stories of how everyday people like you and me are making a difference in the community and the world. You can also find ways to get involved, track the progress that your donations make, or even find charities that accept, and sometimes even pick up donations from your door. I am Glad to Give a little bit of hope and happiness to our troops through care packages, and today I am going to walk through some of my favorite things to send and why, so you can grab a box and send it off too! Every base and duty carried out over seas by our military members is different. If you can have an idea of where you are sending this and what job they perform then that is best. If you know them personally, including the personal items will be the best gift they can get. If you are sending to someone you don’t know then other items may make a better package. Laundry Detergent Pods – Not every service member will have to do their laundry (some have services that do their uniforms,) but if they do these pods are a huge help and super nice to have on hand. Glad Press & Seal- This is great to seal up toiletries or baked goods as detailed below. It creates a leak-proof, air-tight seal so that you can keep baked goods sealed up tight to maintain freshness, and prevent toiletries from leaking and ruining the rest of the contents in the box. When things are shipped over seas, they are packed in huge containers and transported by air or sea so you just have to assume that it will be jostled, shaken, and squished and take the precautions you can to keep it packed up safe! Breath strips/mints – these are the little comforts of home that we take for granted but can be hard or impossible for them to get over seas. These are small and easy to pack along for missions so they work out well. Blender Bottle- There is very little entertainment while overseas, so many troops concentrate on their physical fitness. A blender bottle is perfect for shaking up protein powders that are popular. Power bars- This was the one thing that my husband always requested in his packages. They had no access to them over there and their rooms were small so power bars were something that they could keep in the room and snack on. Name Brand Toothpaste- Another item that is nice to have a familiar brand. Dried fruit – This is one item that ships well and is something that can be easily kept in a dorm room or tent. Powdered Drink Mix – Generally where soldier are they are provided with bottled water day and night. There may not be any other beverages available, so many love to receive the powered drink mixes in single serving sizes that can be dumped in a water bottle for a little extra flavor. Shaving Cream- Also a great item to receive a familiar name brand. Homemade baked goods- If you are sending a package to someone you know, ABSOLUTELY put something homemade in it! They will love eating a taste of home, and it will be a welcome break from the chow hall offering. A couple of tips for packing baked goods. 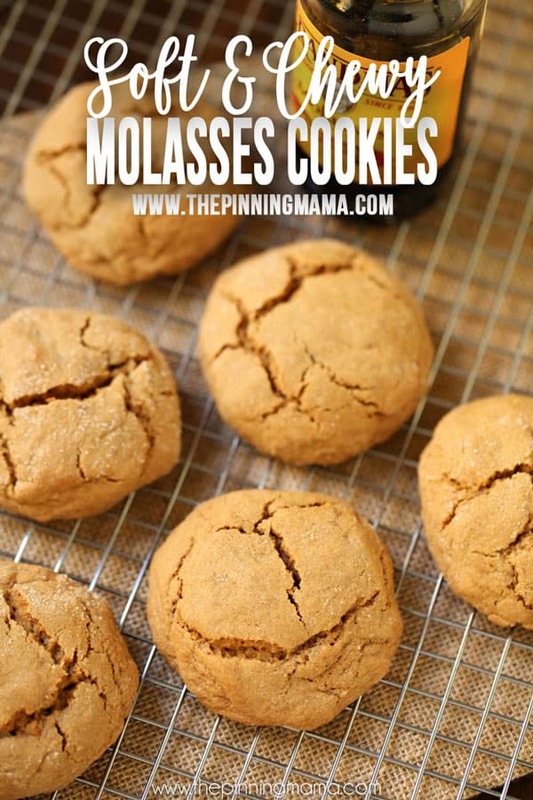 Try packing cookies with a higher moisture content like these Molasses cookies (recipe below.) With the brown sugar and molasses, they keep the cookie moist and fresh for longer! To pack the cookies, I lay the cookies down on a piece of Glad Press and Seal then place a piece on top and use my finger to create a seal around each cookie so they are airtight and stay as fresh as possible. Then I put them in a Glad XL storage container which helps to keep them from getting crushed, even when the package is on the bottom of about 3000 other packages! Body Wash- Similar to other toiletries, having a name brand is a luxury. Beef Jerky- These come in lots of great flavor varieties and can make a great snack in their room or on the go. Nuts- Another great protein rich snack that packs and travels well. Plus they come in a lot of flavors to throw in something new and fun. Music Gift Card- If they have access to the internet, it is awesome to be able to choose some new music or catch up on some TV. This is a little piece of comfort that goes a long way. Baby wipes – If the soldier you are sending the package to goes on long missions, often baby wipes are coveted for using in the field as a substitute for a bath. Since it is very dirty and dusty in most of the places our troops are these can help them feel a little cleaner while they are out in the terrain. Q-tips- A little thing that you didn’t realize how much you missed until you couldn’t get them! Personal Handwritten Note- Whether you know the soldier personally or not, a handwritten note is about the most meaningful thing you can put in a military care package. Even if you are emailing regularly, seeing the handwriting on paper gives a soldier something real to hold onto. My husband brought home many pictures kids (he didn’t know) had drawn and sent over that gave him strength and inspiration while he was there. Small stuffed animal- This may seem a bit silly to send a grown person, but it was one of my husbands favorite things to receive. He took his tiger (their squadron mascot) all around with him on missions and as he traveled and took pictures with it in each place. When he returned we made those pictures into a book for our kids to help explain where daddy had been. Also, if you are a wife sending to your husband, he will appreciate it even more if you give it a spritz of your usual scent, perfume or body spray. You are the thing he is missing most! Name Brand Deodorant- This may seem personal to buy for someone else, but when the alternative is a cheap off brand, then it is a welcome luxury. Chewing gum- An easy thing to keep on hand for a small treat! Body wash/products- Anytime you send a liquid MAKE SURE to seal it in an airtight container. It would be terrible to receive a package with such excitement only to find all of the contents ruined by leaking liquids. I again use Glad Press and Seal to create a seal around each toiletry. Press and Seal works great because you can get it exactly around the shape of the item so you don’t waste a lot of space. I then pack them in the Glad XL Storage Container for the extra protection from being smashed in transit. Hard Candy- Candy is a great treat, but you have to be very careful what you send as chocolate, gummy candies and many others can melt easily in the extreme weather conditions that most of the stations have. Ear Buds- These are great to have since they break or are misplaced easily. A spare set is always a welcome gift! Magazines- Popular magazines are a fun thing to have to pass the time. Just make sure that anything you send is not more than PG-13 or it could be confiscated. Activity books- Crosswords, number puzzle and riddle books are a great addition to a package. Phone Cards- Not all soldiers will have access to internet or the ability to talk to their families even with all the technology available today. They will have to purchase international phone cards to be able to call home and hear a familiar voice! Gift Cards- Some don’t like to send gift cards, but cash value gift cards can be very helpful to soldiers. Those that can get internet access on their base are often charged $50-75 a month to get access. These gift cards can help offset that so that the soldiers can get better communication to loved ones. There is plenty on this list to fill a few boxes. If you know someone personally or through extended avenues, consider putting together a package to let them know that you appreciate their service and there are people back home thinking of them and waiting for their return. Or for more ideas on how to make a difference in your community or the world check out the Glad to Give program and tag them on social with #gladtogive to show the impact you are making in your own way! You can also find Glad on Pinterest, Instagram, Facebook, and Twitter. In a medium bowl mix the flour, ginger, baking soda, cinnamon, and salt until combined. In a large mixing bowl cream the butter and shortening, then add the brown sugar and molasses and beat until light and fluffy. Add in the eggs and stir to combine. Add the dry ingredients into the wet ingredients in thirds stirring well to combine in between each addition. Dough should hold together well, but be very soft. Use a 1/4 cup measure to scoop the dough, then form into a ball and roll in the white sugar to coat. Place cookies on baking sheet and do not flatten. Bake on middle rack for 12-14 minutes or until the edges are just crisp and the middle is set. This is a sponsored conversation written by me on behalf of Glad Products Company . The opinions and text are all mine.